The Beauceron is a herding breed that most often works with sheep, but can also be used with cattle. Unlike many herding dogs, the Beauceron is capable of protecting their flock from predators such as bear and wolves. It is said two Beaucerons can tend several hundred head of sheep, moving them 50 miles or more in a single day. In secondary roles, the Beauceron was used to hunt boar, for protection work, and served as a military and police dog. Its French name, Berger de Beauce, translates to ‘sheepdog from Beauce’. An alternate name, Bas Rouge or ‘red-stockings’, refers to the tan markings on its legs. The Beauceron, along with its close cousin, the Briard, have been known in France since the Middle Ages. Although their French names indicate they are from distinct regions, both dogs could be found throughout northern France. While the first written record of the Beauceron dates back to 1578, it did not receive its current name until 1809. This was in an account by priest Abbe Rozier, who first distinguished the Berger de Beauce as having a short coat and the Berger de Brie as having a longer coat. The two would not be formally separated until 1896 and interbreeding continued into the 1900s. During the World Wars, the Beauceron was utilized by the French military for a wide range of tasks. This included mine detection, carrying messages to the front lines, and bringing replacement ammunition during enemy fire. This service helped increase the breed’s popularity and it spread throughout Europe in the 1900s. North America was slower in giving the Beauceron recognition in comparison to the Briard, it would not be accepted in the American Kennel Club until 2007. 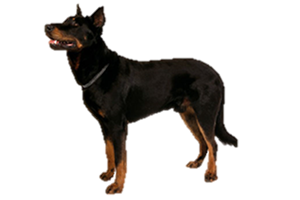 Today the Beauceron is still used to herd both sheep and cattle, as well as protection, police, and military work. Is the Beauceron Right for You?